Here are photos sent in by customers, showing their knits in use or compared with the originals. All photos are used by permission. 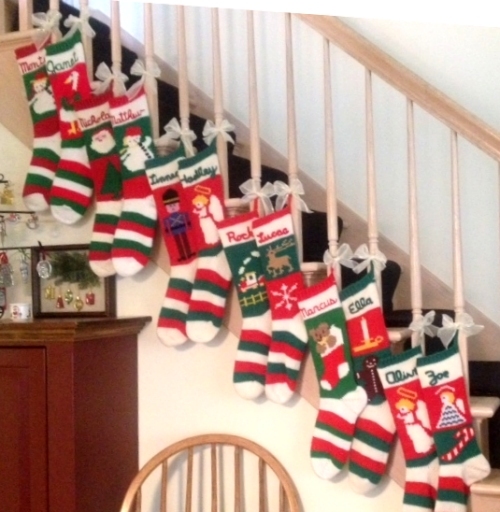 This customer was kind enough to send me multiple pictures comparing her original stocking with my duplication. Here's the original, still in very good condition. It has stretched a bit from hanging while filled with goodies! 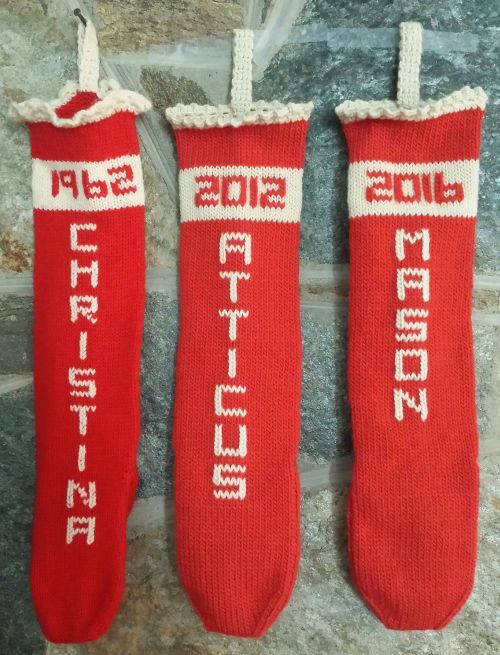 Here's the stocking that I knitted for a new family member. I was delighted to be able to match the colors this closely. An excellent example of how attractive a simple design can be! The ruffled crochet trim adds a special touch. 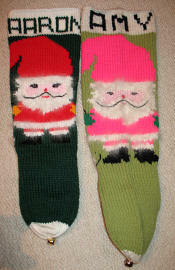 The stocking on the left is the original; she asked me to knit slightly shorter ones for her pets. The red wasn't a perfect match, but it was pretty close. 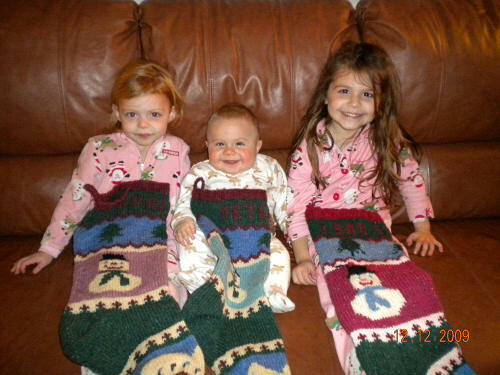 I had the honor of knitting all the stockings for this young family. 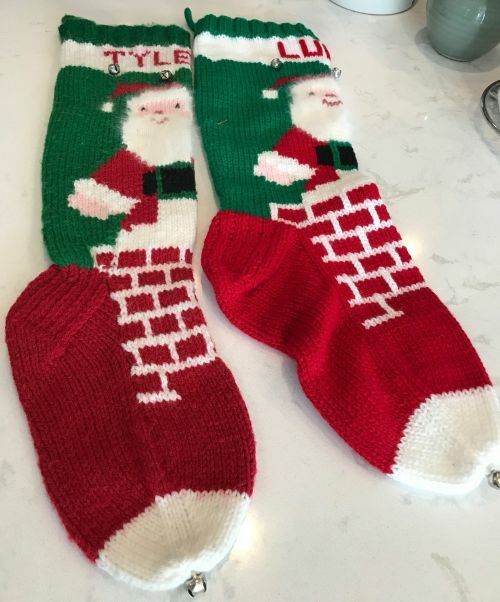 Mom and Dad both have reindeer stockings, while the children all got different designs. All are knitted in wool, with coordinated background layouts. 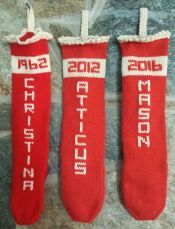 Each stocking also has the person's birthdate on the back. 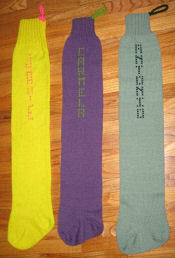 I knitted four of these colorful family stockings. All are similar, but no two are alike. They're in good company, with a roomful of Christmas figures and cheery decorations! This is a cheerful scene! Unlike the family in the previous photo, this family has chosen to have a wide variety of designs. Both approaches work beautifully; it's truly just a matter of personal taste. I knitted several of these, but not all. 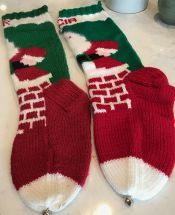 These stockings are variations on a popular pattern called "the 1945 Christmas stocking". 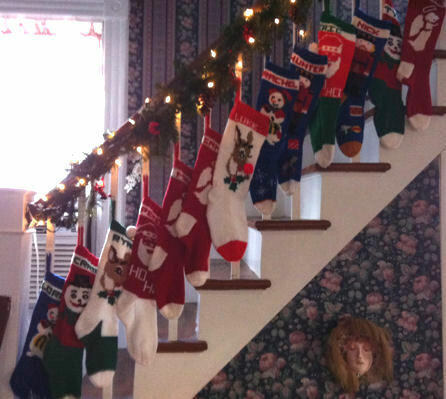 This family's stockings don't go back quite that far, but they do have one from the early 50's. There's an amazing continuity of colors, given the decades spanned by the collection and the different knitters involved. This design is one that I've never seen before. The customer mailed me hers to use as a model. The Santa is quite unique, with fuzzy beard and trim created with yarn woven in and out of the stocking, then cut short. The beautiful rocking horse is handmade also, by the new baby's grandfather! 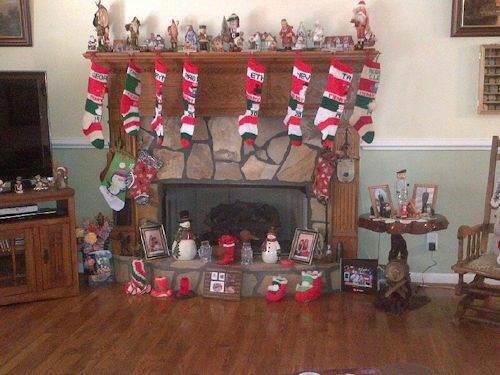 These family stockings show a wonderful variety of pictures, while maintaining a very recognizable style. The consistent patterns of red, green, and white keep them strongly connected, while the little splashes of other colors add a lot to the interest. 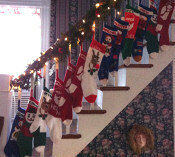 I knit about half of these stockings, over the last several years. A grandmother sent me a photo collage of the stocking I knit for her granddaughter with a photo of the granddaughter. 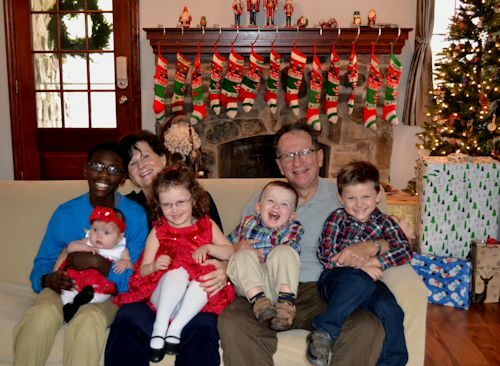 These six children have each received a red and white Christmas hat from their grandmother. 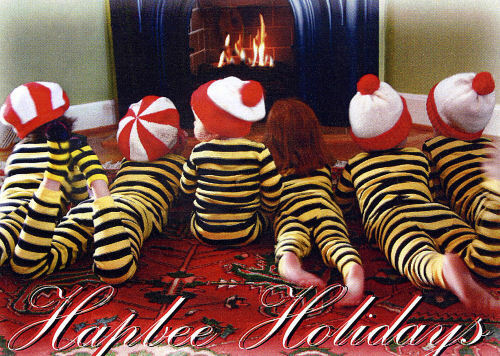 Of course, getting six children to wear hats all at the same moment would take a Christmas miracle! 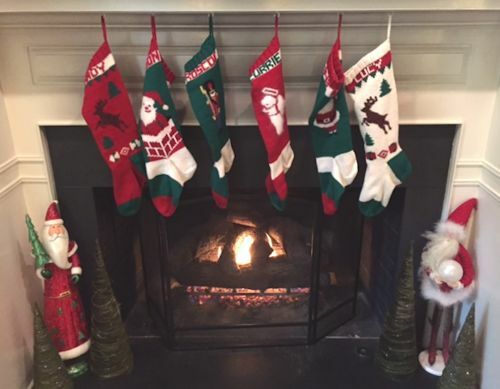 This family has a stocking tradition going back quite a few years! The design is very cheerful, although the knitting is simple. A felt tree is decorated with various sequins and other trims, and set between the words "Merry" and "Christmas". The pompoms at the heel and toe add a whimsical touch. I knitted two of these, and did repairs to one other. A wonderful collection of stockings with a number of different pictures. 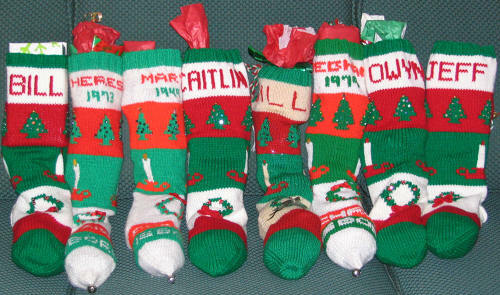 I knitted these to match some existing stockings, so that the whole family would have stockings. Some use the same pictures, but small variations were made to personalize them. For example, one of the toy soldiers has blond hair and the other has brown. 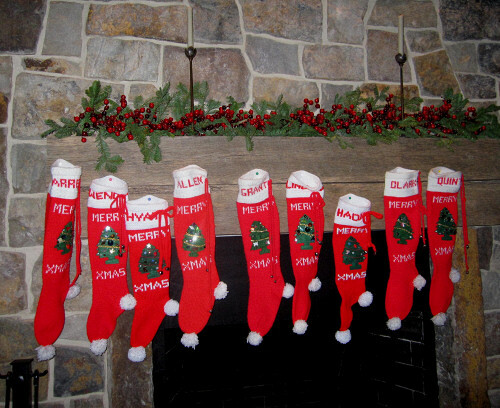 All the stockings are the same size and shape, knit from wool yarn. 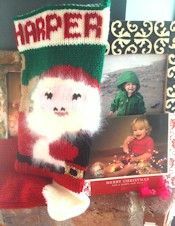 The snowman stocking on the right was a gift for the first child. The mother asked me to duplicate the design when the second and third children were born. We changed the snowman's background from pink to blue for the little boy. These stockings are knit in a wonderful rustic style wool. It's a bit thicker than the wool I regularly use, and has rich shaded colors that are just beautiful. 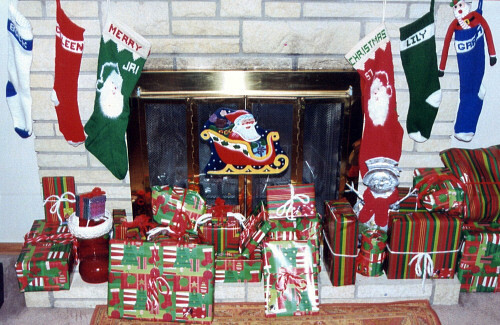 The red Santa stocking on the right has belonged to my customer for many years. She asked me to make a partner stocking for her husband, the green Santa on the left. 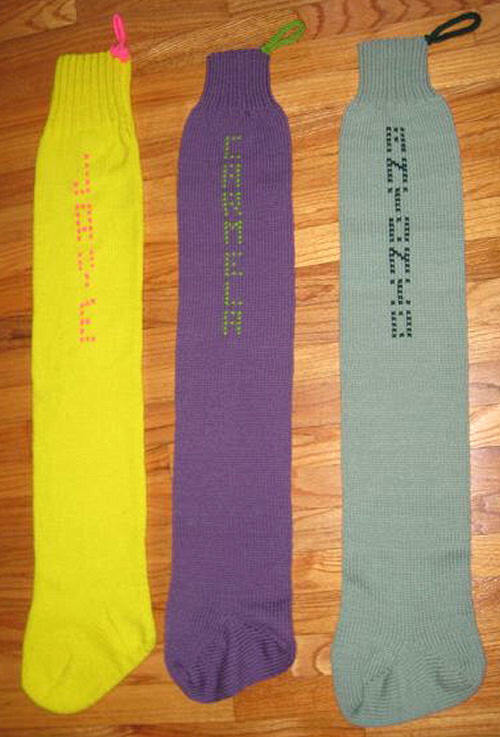 I knitted the two-color stockings for their grandchildren and family pets. 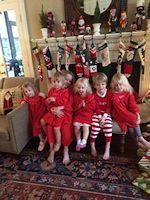 These lucky beagles got to wear custom scarves for their Christmas photo. 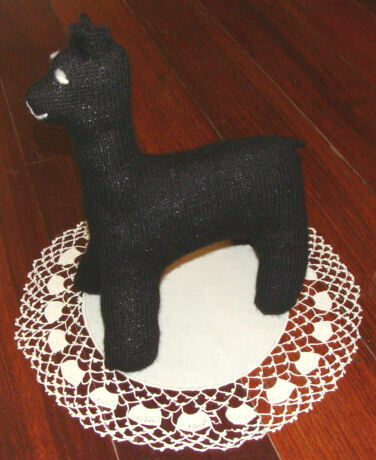 This alpaca was knitted from a pattern I wrote for a breeder of black huacaya alpacas. She had a friend knit one to be sure the pattern was easy to follow. The yarn is a wonderful quality natural 100% undyed alpaca. 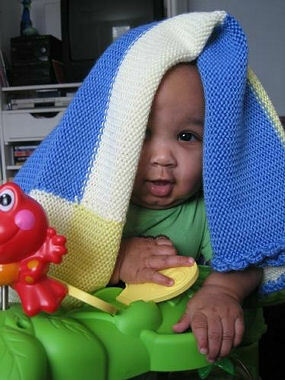 This baby blanket was knitted in a very soft acrylic, so it can be machine washed and dried as often as needed. There is no fringe for baby to choke on, and there are no holes for little fingers to get caught in. 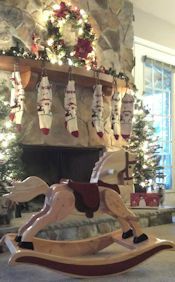 Amy sent me photos of her stocking so that I could duplicate the unusual Santa. She asked for color changes as well. 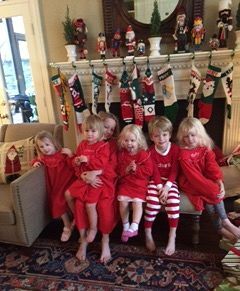 This family had added several family members, and wanted matching stockings for them. 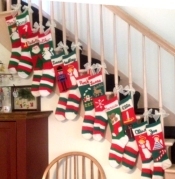 I knit five of the eight stockings in the photo. 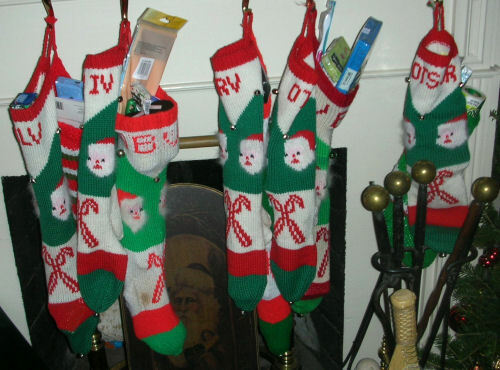 This family had stockings in two variations of the same design. I was asked to knit 4 more stockings using the variation in the original "Bill" stocking. 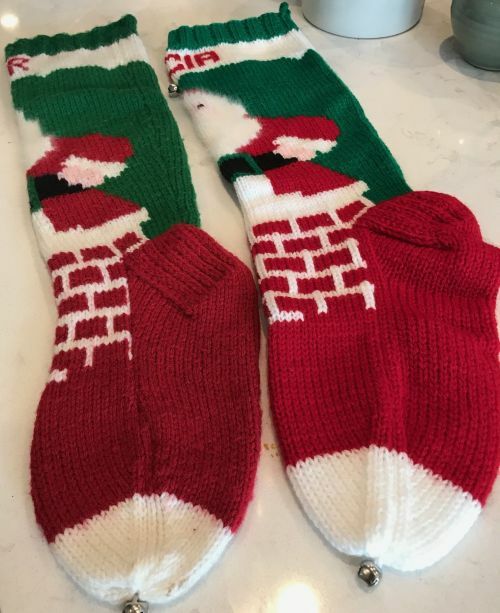 The stocking on the left is the original that I was asked to copy. It was so unique that the customer preferred not to mail it, so she sent me several photos and measurements. This is the photo she sent after the new stockings arrived. Return to About Primarily Practical Knits.